Licorice is often used in bronchitis and cough remedies to soothe sore throats. It is expectorant, anti-inflammatory, and directly antiviral. 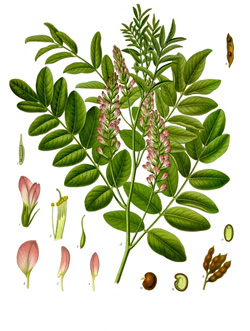 A licorice derivative, deglycyrrhizinated licorice (DGL) is an excellent demulcent, and commonly used for throat, stomach, urinary, and intestinal irritations. Licorice has estrogenic and other steroidal properties and is used to normalize and regulate hormone production. (Gladstar, Rosemary) Altogether licorice root has such wide ranging and diverse medicanal properties it is no wonder it remains one the most widely used herbs in the traditions of many cultures both East and West. Licorice Side Effects: Not for long term use without medical advice, the key to using licorice is moderation. 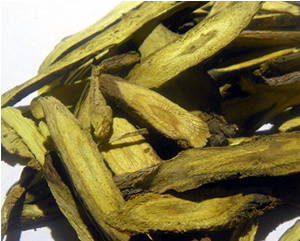 Licorice root can elevate blood pressure, lower potassium and cause water retention. Not for those who have hypertension, kidney problems, diabetes or heart problems. Flowers/Fruit/Seeds:From the axils of the leaves spring racemes or spikes of papilionaceous small pale-blue, violet, yellowish-white or purplish flowers, followed by small pods somewhat resembling a partly-grown pea pod in form. In the type species glabra, the pods are smooth, hence the specific name; in others they are hairy or spiny. Parts used: Roots The underground system, as in so many Leguminosae, is double, the one part consisting of a vertical or tap root, often with several branches penetrating to a depth of 3 or 4 feet, the other of horizontal rhizomes, or stolons, thrown off from the root below the surface of the ground, which attain a length of many feet. Leaves:The plants are graceful, with light, spreading, pinnate foliage, presenting an almost feathery appearance from a distance. The leaflets (like those of the False Acacia) hang down during the night on each side of the midrib, though they do not meet beneath it. Licorice is not really a flavor, rather the herb licorice has the sweet, somewhat musty flavor of anise. Licorice root is derived from the Mediterranean native species Glycyrrhiza glabra, the pea family. It was know to the old Greek writers, and mentioned by Theophrastus to be used for asthma, dry cough, and all diseases of the lungs. The plant was being cultivated in Europe and England by the end of the sixteenth century, is naturalized in North America. China has at least six species and Chinese herbals from every dynasty in Chinese history give the plant prominent recognition. As in the past, licorice is still one of the most commonly used traditional medicine herbs.